It’s funny how life unfolds. One minute, I’m creating a blog because I’m bored and miss writing, and the next thing you know, I’m back to writing part-time for pay. On my off days, I sometimes travel to spend time with my husband, and I also drive out of state to care for my Mom. Enter a couple of medical emergencies, and I’ve relocated to become a full-time caregiver, and the writing has just about stopped. This monarch butterfly (on milkweed) surprised me on a recent morning walk. Mom’s flowers, and the new hummingbird feeder, have attracted at least four of these fiesty beauties. An allium in Mom’s yard, opening earlier this summer. 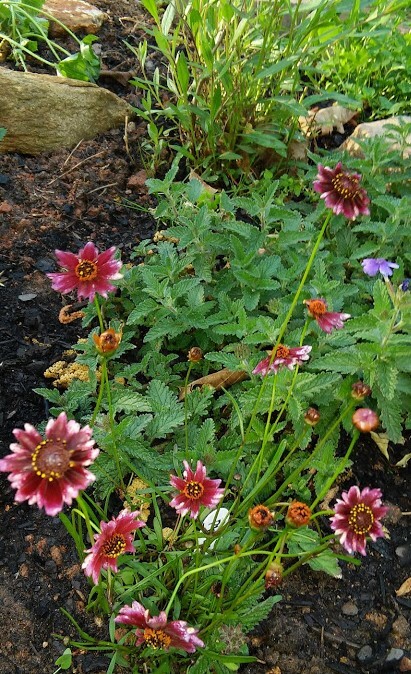 Coreopsis is a summer favorite; I hope this one thrives. Now that it’s mid-April, plant sales are springing up all over. I spent much of yesterday in search of Black-eyed Susans to replace my pair that did not survive the Winter, and some more of those diaphanous Indian feathers I discovered last year. I found neither. 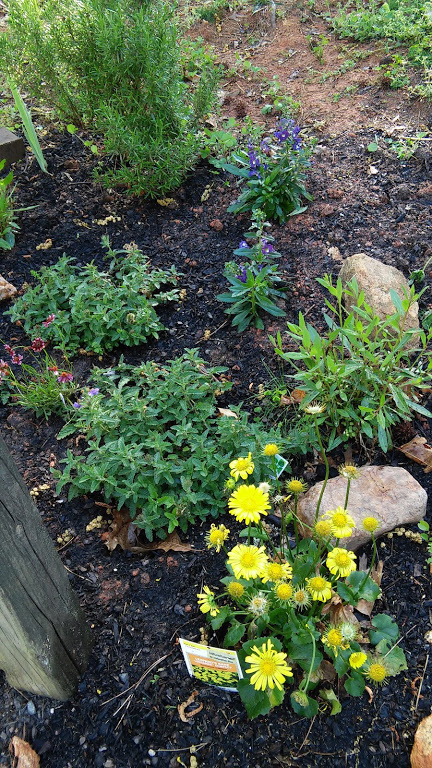 But, I did come home with some willowy (I’m hoping) coreopsis and several angelonia, which I am delighted to find should bush out quite a bit and bloom all Summer long. Leopard’s bane, backed by Indian feathers and a new purple angelonia. Since I couldn’t find any Black-eyed Susans, I would have bought several more of both the coreopsis and the angelonia, but I happened upon that particular high school plant sale a little too late. Most of the flowers I liked had already been plucked by other gardeners. The flower bed in front of the house is filling out, although I think I need to get some more heuchera to keep the ones I have company. The bleeding hearts are blooming, though,and so is the Indian Hawthorn I brought home last year. Out back, I repositioned and fertilized the hydrangea and planted my husband’s tomatoes, as well as the new butterfly bush I found for just $5. If everything grows as planned, we should enjoy a colorful Summer. Are we there yet, Spring? I’ve been in an awful rush for Winter to be over this year. It’s been really mild, as far as Winters go, but as nice as it is to curl up in front of my warm fireplace on chilly days and nights, Spring just can’t get here fast enough this time around. Last month, I had such a bad case of the Winter blahs I went shopping in search of flowers. And found nothing. (It was February.) It’s been so warm lately, though. So yesterday, I went to find some soil conditioner, which I like much better than mulch, because you can use it in and on top of the soil, and, well. I found everything from flowering spring plants to blueberry bushes. It was a feast for Winter-weary eyes. My husband, who is working hard a few states over, will be pleased to know I did not go overboard. The few plants I selected are starting to bloom now, and several should flower all Summer long. With sunny yellow flowers and a name like leopard’s bane, who could resist? I took a long time deciding, but came home with leopard’s bane, some bushy plants with purple blooms that are supposed to attract butterflies, and a few inexpensive lavender plants. I’ve been wanting some good lavender for a long time, and the last plant I purchased didn’t do well at all. I forget what they’re called, but these plants with purple flowers are supposed to be butterfly magnets. In addition to all the digging and mulching I did yesterday, I transplanted my perpetually unhappy ground-hugging gardenia – again. I’ve moved it, revived it, split it, given part of it away on several occasions, but I haven’t killed it yet. It’s always happier in a container than in the ground, so I found the Ironite and moved the bush into a rectangular planter I never know what to do with. We’ll see how it goes this time. Poor, unhappy gardenia. Maybe this daffodil will cheer it up. My husband’s grapevine is waking up already. I know we have another month to go before the danger of frost is gone, so I hope it will be OK. This grapevine is already producing leaves. Last year, a little grey tree frog took up temporary residence on its branches. Unbelievably, our little strawberry plant, which did very little last year in the way of fruit, stayed green all winter long. Right now, it has one bloom. This is not the best planter for a strawberry, but it kept the berry plant alive and green all Winter. Spring officially arrives Sunday. I’m trying to decide if I should go ahead and plant the lavender, or wait until the danger of frost is past. At any rate, my Indian feathers, which are already sprouting, have some flowering plants to keep them company by the mailbox until they, too, start to bloom. If I had the space, and the money . . . but I don’t. Until then, this little garden of mine will have to do.